Weaving a tapestry is much closer to telling a story than painting a picture. For one thing the process requires you to start at the bottom, building up the image bit by bit with each element on top of the previous one until you get to the top. 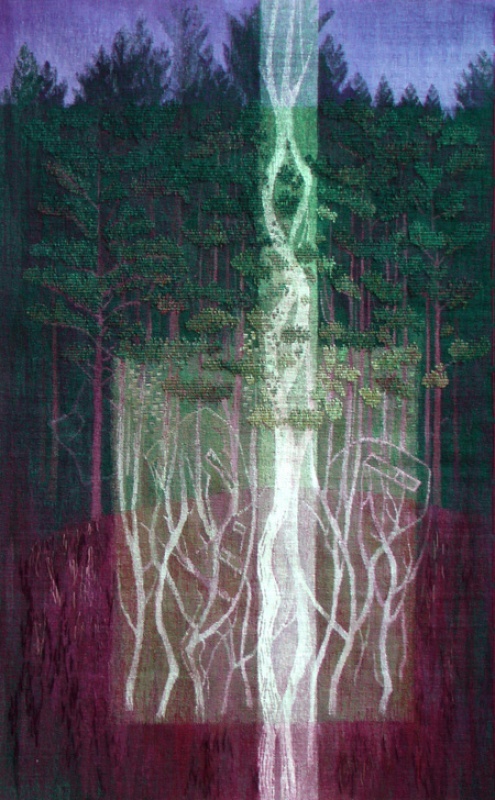 So in its very structure a tapestry has a linear development akin to the 'once upon a time.......and they all lived happily after' nature of a story. When I weave it certainly feels like I am telling myself a story especially because so much of what I produce is a surprise to me. I don't have a visual imagination so I never have a clear picture of how the tapestry will look before I start the design, but I do know what it will 'feel' like. Nothing can be created without the 'story'. The story is the initial inspiration for the tapestry and my constant companion during the slow weaving process. Choosing subject matter is not always a deliberate decision and it is not always a clear narrative. It might be something as nebulous as a feeling or it might be a train of thought sparked by a landscape or a walk. It might be a subject I have been researching over a period of time or a piece of writing or music that has suddenly moved me. Creating a broad composition for the tapestry is the first step in transposing the story in my head into a visual form. I start by making a series of small outline drawings to try to find what shape and proportion the piece might take and where the main compositional elements might fall within it. I find working on paper extraordinarily difficult beyond these initial sketches, since the marks, colours and textures bear no relation to what the tapestry might look like. Collage is often a more useful design tool than paint or pencil, you can work broadly, describing area rather than line...and tapestry is about area. Usually I work on up to a dozen similar designs at once, working quickly between all of them, discarding, re-working, tearing up and collaging. I scan any that look promising, print them onto drawing paper and continue to work on the scans so I can return to the original if I need to. Increasingly I use my own digital photographs in this phase as part of the mix. I start weaving samples as soon as I get stuck with the paper designs, moving between sample loom and drawing board until I warp up my loom for the tapestry. I use samples to work out a colour palette, to try out any new techniques or materials I might want to use and to work through immediately obvious solutions so I can use more exciting ones in the tapestry.